This story was updated at 12:11 p.m. EDT. A privately built rocket and spacecraft lit up the pre-dawn sky over Florida early Tuesday (May 22), embarking on a historic flight to the International Space Station. California-based Space Exploration Technologies, or SpaceX, launched its unmanned Dragon capsule into orbit this morning atop the company's own Falcon 9 rocket from the Cape Canaveral Air Force Station in Florida. 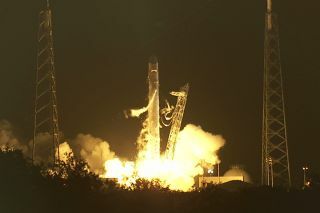 The successful liftoff came after a rocket engine glitch forced the company to abort a previous attempt over the weekend. The capsule is headed to the space station as part of a demonstration flight to test the vehicle's ability to carry supplies to and from low-Earth orbit. "Congratulations to the teams at SpaceX and NASA for this morning's successful launch of the Falcon 9 rocket from Cape Canaveral Air Force Station in Florida. Every launch into space is a thrilling event, but this one is especially exciting because it represents the potential of a new era in American spaceflight. Partnering with U.S. companies such as SpaceX to provide cargo and eventually crew service to the International Space Station is a cornerstone of the President's plan for maintaining America's leadership in space. This expanded role for the private sector will free up more of NASA's resources to do what NASA does best — tackle the most demanding technological challenges in space, including those of human space flight beyond low Earth orbit. I could not be more proud of our NASA and SpaceX scientists and engineers, and I look forward to following this and many more missions like it." "Bravo! The video has looked great! RT @SpaceX: Liftoff!!!! #DragonLaunch spacex.com"
"The entire team at SpaceX and at NASA should be commended for their success on this third test flight of the Falcon 9 rocket. The preparations and precautions taken by SpaceX and NASA in months past have contributed to their exemplary performance today. After seeing the smooth launch SpaceX just executed, it is easy to forget that this is indeed rocket science." "I want to congratulate SpaceX for its successful launch and salute the NASA team that worked alongside them to make it happen. Today marks the beginning of a new era in exploration; a private company has launched a spacecraft to the International Space Station that will attempt to dock there for the first time. And while there is a lot of work ahead to successfully complete this mission, we are certainly off to [a] good start. Under President Obama's leadership, the nation is embarking upon an ambitious exploration program that will take us farther into space than we have ever traveled before, while helping create good-paying jobs right here in the United States of America." "This mission proves the American spirit of innovation is thriving. This is yet another example of how American aerospace is truly second to none. Continuing collaborative investments in NASA's commercial crew program will be crucial to ending our dependence on Russia for astronaut launch. This launch, along with other investments NASA and industry are making, shows that our nation still has the right stuff." "This is a testament to the viability of the commercial spaceflight industry. Congratulations to SpaceX for successfully completing the first steps of this demonstration flight. Elon and his team's success today is an important milestone in achieving a sustainable space program." "I congratulate NASA and SpaceX on a successful launch, and wish them success on the demonstrations to be performed on this flight. This test flight is considerably more ambitious than their last test flight and if all of the demonstrations in this complex flight go as planned, the Dragon capsule will berth with the International Space Station and actually deliver cargo to the astronauts. Private industry and NASA are taking these next steps together, which will hopefully become the new way of doing business in space." "SpaceX once again shows how much it carries the mantle of our earliest space endeavors by achieving what many experts considered impossible just a few short years ago. This program brings NASA one more step in the right direction. We must change orbital spaceflight from being dependent on and controlled by government employees, toward more entrepreneurial, cost-effective, commercial-based alternatives." "SpaceX's successful launch this morning is a great accomplishment, and is an important milestone for commercial spaceflight. The shuttle may be retired, but the American dream of space exploration is alive and well, and the commercial space industry is working hard to provide U.S. access to low-Earth orbit." "This demonstration flight for NASA's COTS program provides valuable experience for SpaceX, but also for NASA and the entire industry that will be carrying cargo and eventually crew to the International Space Station. Congratulations to SpaceX for extending their streak of successful Falcon 9 launches." "This flight is an important milestone as NASA and SpaceX develop the next generation of U.S. spacecraft to carry the critically important experiments, payloads and supplies to our remarkable laboratory in space." "We would like to congratulate SpaceX on a wonderfully executed launch today. This launch acts as a pathfinder for the continuing success and innovation of the U.S. Space Program and we look forward [to] working with SpaceX to deliver groundbreaking research to the U.S. National Lab."